Thirlwall Castle is a 12th-century castle atop a high man-made mound overlooking the River Tipalt. The castle was built almost entirely using stones from Hadrian's Wall, which runs nearby. The origins of Thirlwall date to the period 1153-1165 when King Malcolm IV of Scotland created a barony here. The first baron took the name of his new barony and built a timber manor house. That timber manor was rebuilt in stone by John Thirlwall around 1330. 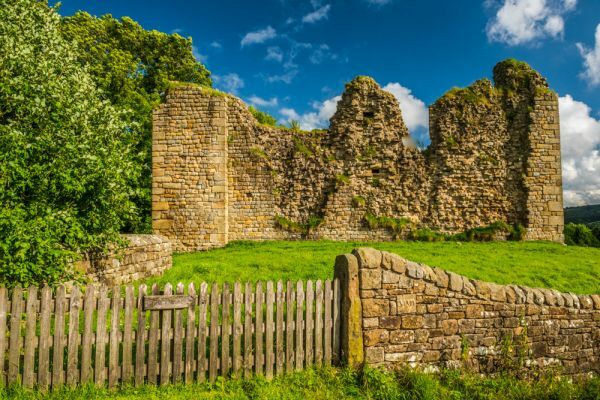 The ready availability of stone from Hadrian's Wall meant that this relatively impoverished family was able to build a sizeable and impressive stone fortress. Thirlwall was laid out on an L-plan, with a rectangular block standing four storeys high linked to a five-storey tower at one angle. The walls vary from 2.5 to 3 metres in width. Edward I is known to have visited Thirlwall in 1306, but it seems almost certain that he stayed at the timber manor house. One of the later owners of Thirlwall Castle played a part in the Battle of Bosworth. Sir Percival Thirlwall acted as the standard bearer for King Richard III during the battle, and, so the story goes, heroically held the standard aloft even after his legs were cut from under him. His heroic stand was to no avail, for Richard was killed and the kingdom lost on Bosworth field. Thirlwall's location near the border with Scotland made it a target for raids during the interminable conflicts that raged along the border during the medieval period and into the 16th century. An old legend tells that John Thirlwall returned from foreign wars with a table of solid gold and a pitch-black dwarf to guard it. The golden table raised the attention of Border chiefs, who coveted it for themselves. A group of Scottish raiders attacked Thirlwall and overcame the defenders, but when they came to the chamber where the table was held they found it empty. One of the soldiers claimed he had seen the Black Dwarf throw the table down the castle well and leap into the well after it. The dwarf is said to guard the golden table to this day, keeping it safe in a secret chamber far beneath the ground, aided by a magic spell which can only be broken by the son of a widow. We looked for the castle well, but didn't find it or any sign of a dwarf or golden table! Take the story of the golden table and its guardian with a grain of salt, for the historical records suggest that Thirlwall Castle was never attacked. Its only military service came in the English Civil War when it was seized by Scottish troops supporting the English Parliament in their conflict with the crown. When James VI of Scotland came to the English throne as James I, he cracked down on violence along the English border. The need for fortifications like Thirlwall Castle declined as the border region became more peaceful. 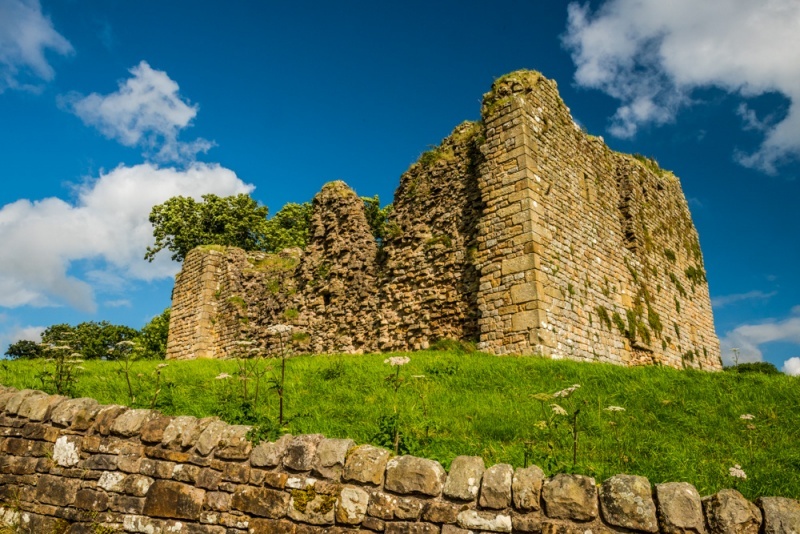 The Thirlwall family relocated to Hexham, and the castle was abandoned to the wind and rain. 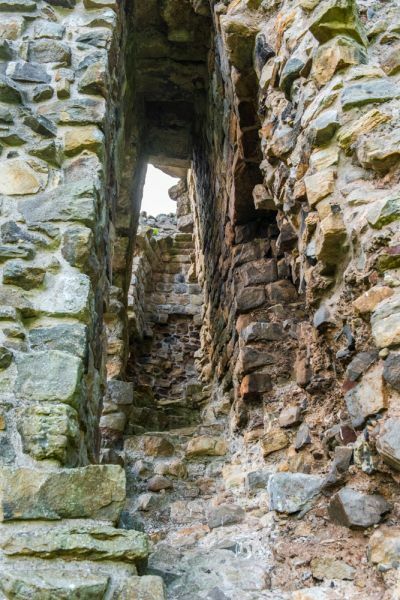 Another theory suggests that the castle was so badly damaged by Scottish troops during the Civil War that the Thirlwall family did not think it was worth repairing. The Earl of Carlisle purchased the estate in 1748 but he was only interested in the land and allowed the caste to decay. 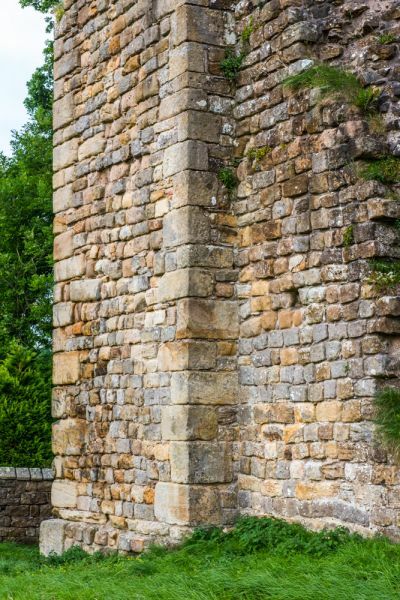 By the latter half of the 18th century the castle's forlorn, romantic exterior brought artists to paint the ruins, and also attracted historians investigating Hadrian's Wall. In 1831 the entire east wall of the castle fell into Tipalt Burn, leaving the remainder open to the elements as it is today. 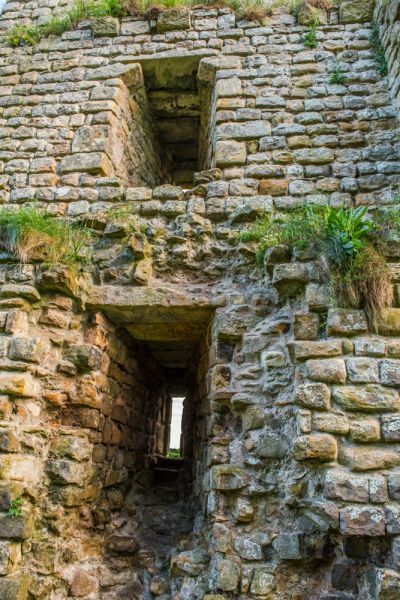 Stones were robbed from the castle walls to build nearby buildings, but after centuries of neglect, Thirlwall was rescued from further disintegration by the Northumberland National Park Authority, who maintain the site. The old Roman road of Stanegate runs past the castle. To the south stands the ruins of a 13th century fortified manor known as Blenkinsopp Castle. 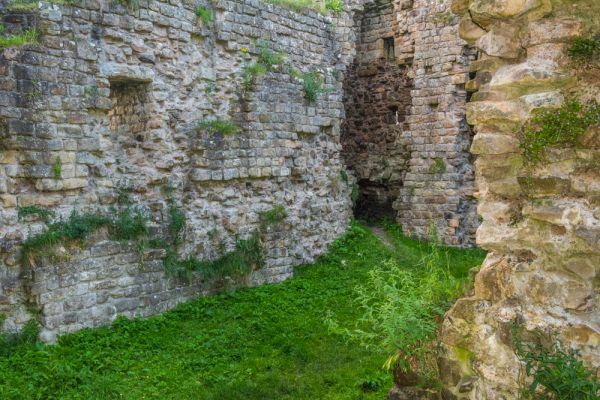 An old story claims that a secret tunnel runs from Blenkinsopp to Thirlwall Castle, a distance of some one and a half miles. The castle is not signposted, but is nevertheless very easy to find, especially if you are approaching from the west, on the B6318 via Gilsland. From that direction, you can see the castle rising like a beacon above the hamlet of Longbyre. Take the lane into the village and turn off onto the road over the railway junction. You pass over the junction and follow the lane through a farm field. Watch out for cows; they don't always move out of the way for vehicles, as we discovered. When you come to Thirlwall Castle farm there is space along the edge of the road for 4-5 vehicles. From there it is a short stroll downhill to the castle. There is an information panel by the entrance to the site, and another beside the castle itself. If you don't mind a slightly longer walk there is a National Park parking area off the B6318 just outside Longbyre, on the way to Greenhead. 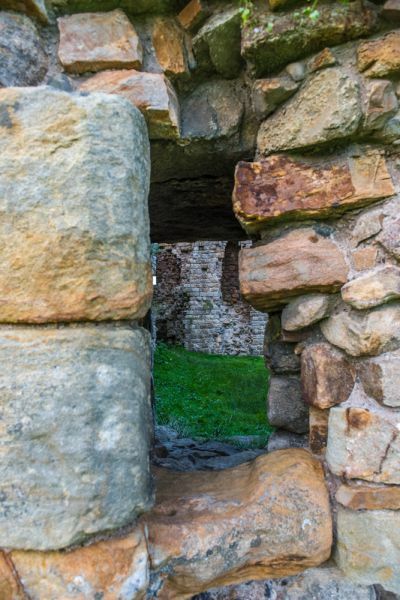 One interesting feature at Thirlwall is that one section of wall has collapsed, allowing you to see directly into the tower wall, where you can see remains of the internal stair and passage built into the thickness of the wall. Location: On a minor road about 4 miles west of Haltwhistle. The castle is accessible at any time.